There are many options for snowboarding in Northern Michigan. This area has some great resorts that will challenge you and your ability. Northern Michigan Terrain Park is located in Bay Harbor, Michigan at BOYNE resort. They offer terrain for all levels of boarders. There are short and wide beginner boxes to expert rainbow and serpent rails. There is also a half pipe and superpipe to challenge you. Adult and child snowboard packages are available to rent along with helmets. Nub's Nob is located in Harbor Springs, Michigan. Its superpipe, the first in the Midwest, was ranked in the Top 5 Pipes on the East Coast in the 2009 Transworld Snowboarding magazine survey. There are both beginner and expert terrain parks that are well-groomed and great for all level boarders. The expert park has ten rails and the beginner park has three low rails. There is also a Free terrain park for those just learning to snowboard. This park was designed by a US Open Snowboard Champion. It features a low to the ground rail that is perfect to learn some moves on. For beginners, Nub's Nob offers an introduction to snowboarding program that includes rental equipment. Crystal Mountain is located in Thompsonville, Michigan. It was named the #1 Resort in the Midwest by SKI Magazine. There are two terrain parks and a 700-foot halfpipe. One park, Tuck's Terrain Park, includes a 10 foot mini box, 11 foot rail, 20 foot down rail and a 24 foot C-Box. They plan on adding more features as well. For example, recently a rainbow box and an A-box have been constructed into a large combination feature. Caberfae Peaks is in Cadillac, Michigan. It has two parks that offer a variety of elements. Cammy's Park is located on the upper mountain. 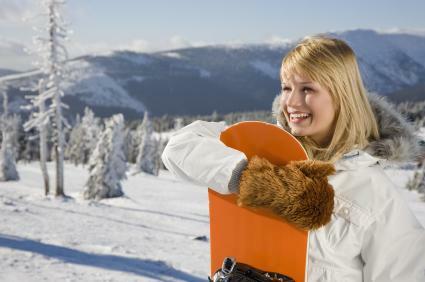 It is for the more expert boarder and offers both intermediate and advanced features. It has rails and boxes and a rail slide. There is also 12 foot long, 6 foot high Wall Ride with a quarter-pipe at the bottom. Little Jibbers Park is located near the main lodge and is perfect for beginners. Since it is located near the base of the mountain, more people can watch snowboarders in action. It is perfect to test out new tricks. Shanty Creek Resort is located in Bellaire, Michigan. It has a variety of terrain featuring rails, boxes and tabletops. The parks are groomed daily and well-maintained. For those just learning to board, try the beginner area where there are small jumps and rails. Check out the Snowsport Academy for snowboarding lessons for all ages and skills. Northern Michigan is ideal when it comes to snowboarding. No matter what level snowboarder you may be, most resorts offer a variety of terrain that is great for all levels and skills. Check out some of the many resorts in the area that offer snowboarding and have fun out in the snow this winter.